With the emergence of Web 2.0 and with GPS devices becoming ubiquitous and pervasive in our daily life, location-based services are rapidly gaining traction in the online world. The main driving force behind these services is the enabling of a very personalized experience. Social-media websites such as Flickr, YouTube, Twitter, etc., allow queries for results originating at a certain location. Likewise, the belief is that retro-fitting archives with location information will be attractive to many businesses, and will enable newer applications. 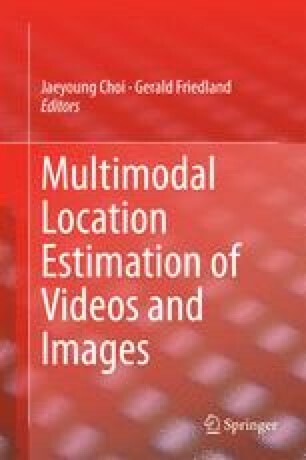 The task of estimating the geo-coordinates of a media-recording goes by different names such as “geo-tagging”, “location estimation” or “placing”. Geo-tagging multimedia content has various applications. For example, geo-location services can be provided for media captured in environments without GPS, such as photos taken indoors on mobile phones. Vacation videos and photos can be better organized and presented to the user if they have geo-location information. With the explosive growth of available multimedia content on the Internet (200 million photos are uploaded to Facebook daily), there is a dire need for efficient organization and retrieval of multimedia content, which can be enabled by geo-tagging. Geo-location information further helps develop a better semantic understanding of multimedia content. These are some of the main motivations of the MediaEval Placing task [1, 2].